Let’s say you’ve got a really cool Automator workflow that saves you tons of time but takes a while to run. Do you really have to sit around, twiddling your thumbs while waiting for it to finish? Wouldn’t it be nicer if you could go get a latte instead and get an alert on your iPhone when the workflow is finished? That’s just one example of the kind of thing possible with the latest version of If This Then That (IFTTT). That’s because IFTTT 2 introduces a new iOS Notifications channel. Simply put, that means you can make your IFTTT recipes send you notifications when certain events occur. That done, you can start building a recipe to display your Automator notifications. The first step is to choose the “this”—the event that triggers the recipe. In this case, click on the Create link at the top of the IFTTT homepage. Click on the blue This link, and select the Email channel. 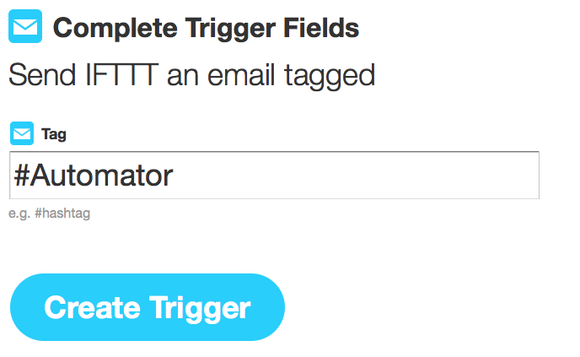 Choose Send IFTTT An Email Tagged as the trigger. Enter the tag Automator, then click on Create Trigger. Telling your recipe to run whenever a tagged email is received. 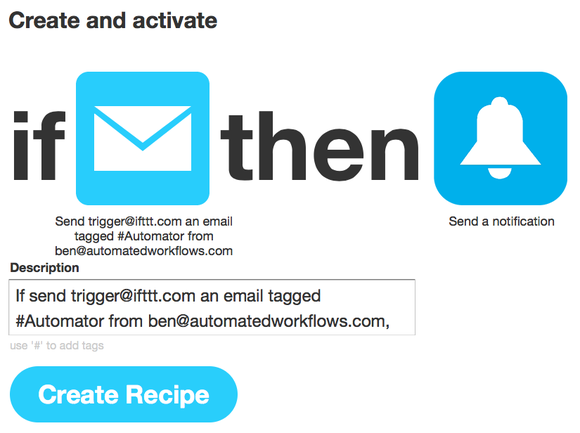 You’ve now told IFTTT you want the recipe to run whenever an email is sent to trigger@ifttt.com from the email address you provided when you signed up for the service, with #Automator in the subject. The next step is to choose the “that”—the event that occurs when your recipe runs. To do so, click on the blue That link This time, select the iOS Notifications channel and select the Send a Notification trigger. In the Notification area, enter Automator: and leave the Subject field as-is. Tip: You can click the + button to re-add the Subject field if you remove it by mistake. Now just click Create Recipe to finalize and activate it. Next, launch Automator on your Mac. Open up the Automator workflow you’d like to receive notifications for. At the end of the workflow, add a New Mail Message action, followed by a Send Outgoing Messages action. Set the New Mail Message action to ignore its input (from the Action menu). Then, set its To field to trigger@ifttt.com, its Subject field to Your Workflow is Complete! #Automator, and its Account field to the email address you used when you set up your IFTTT account. That’s all there is to it. Now, whenever your workflow runs, it will email IFTTT and a notification should appear on your iPhone. Tip: If the notification doesn’t show up, double-check your recipe configuration and make sure you’ve set your iPhone to allow IFTTT to display notifications (in Settings > Notification Center). You may also need to enable Background Sync in the IFTTT’s app’s settings. 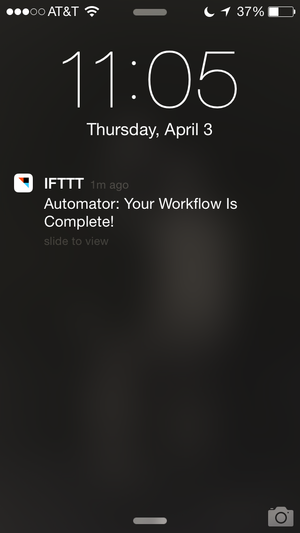 Of course, the Automator workflow scenario is just one possible application of IFTTT’s iOS Notifications channel. You could also, say, build a Calendar Alarm Automator workflow that sends notifications to your phone at scheduled times. Or a Folder Action workflow that notifies you when someone drops a file into a certain folder in your Dropbox. Or an application workflow that reminds you how awesome it is that you can display notifications on your iPhone with Automator.